Entabeni Private Game reserve in South Africa, is set in the world heritage Waterberg region and is home to the big 5. It spans over 22,000 Ha of open plains, wetlands and mountainous terrain. To discover this land on horseback, is a privilege which Princess Cecile von Auersperg shares with small groups of riders. The essence of the African bush is captured at its fullest allowing you to become one with nature. On safari horseback riding vacations, the guides lead the group safely, sometimes climbing steep rocky terrain, picking up speed on sandy tracks, or chasing the sunset on open plains. The safari takes you on a route on horseback, tracking animals and quietly approaching elephants, zebras and giraffe among a large variety of iconic creatures, stopping for the night at different destinations in the bush. The ride starts with a night on the lower escarpment, at a beautiful intimate lodge for a soft introduction to the bush. The tented camp offers the comfort you would expect from a lodge, with the African feel of a camp set back in the Hemingway days. The following day, the adventure continues up the steepest man made road in Southern Africa, with a gradient of 40 degrees on some points – where guests partially lead and ride their horses alongside jagged rock formations and riverine vegetation. Waterfalls set the scene as the path opens up and leads the way to Out in Africa’s mobile tented camp, set by a crystal clear river. Four nights are spent under canvas, in beautiful tents with candle lights and lanterns for a romantic feel which will set you back in time while you indulge in stories around the open fire. The route on horseback ends at Ravineside Lodge, where guests relax and are pampered after a few days in the saddle. The lodge itself is set on stilts, resting between mountains, offering breathtaking views. When we think of “Africa” our mind starts to wonder. Images of wild animals, remote wilderness and red sand dust wafting through the air. To experience this on horseback is a dream dwelling in our minds. Princess Cecile von Auersperg, Owner of Out in Africa Encounters, has created an oasis of peace and tranquility on Entabeni Nature Reserve where she accompanies her small group of equestrians on safari through this majestic land, to view a large variety of animals in their natural habitat from the back of well trained and adapted horses. In order to comfortably and safety approach, at times dangerous animals, the human and horse partnership has to be at its highest level. Why not explore this relationship further, and work at a psychological and physiological level with the horse? Cecile went on to explore possibilities to share this evolutional experience with guests – taking this concept further, in a wild setting where the horse is at its finest. Paul Rogers, from Remuda International, has been working with difficult horses and their riders, for decades, in his home town of Ellensburg in the USA and abroad. His wealth of experience in natural horsemanship, was a keystone in creating a partnership which would combine natural horsemanship and the African experience at its fullest. Upon arrival at Johannesburg airport, a representative meets the guests at the airport for a two and a half hour journey to the reserve, situated in the World Heritage “Waterberg Biosphere” of the malaria free Waterberg region. Entabeni Nature Reserve “The place of the Mountain” boasts five eco-systems. The upper escarpment offers majestic craggy rock formations and wide-open grass plains. The lower and upper plateau are separated by 600m high cliffs where you can explore sandveld vegetation and wetlands. 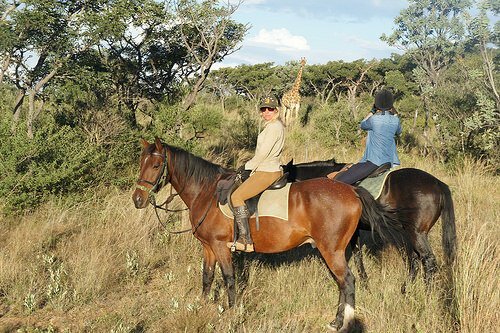 The greater area of this reserve is home to the herd of safari horses, which are matched up with the rider on arrival day allowing an intimate bond to unfold throughout the 8 day riding clinic. Guests work with the horses, implementing a variety of techniques while the overwhelming wide open spaces allow for herd animals, such as zebra and wildebeest, to add to the backdrop against the African skies. A traditional lunch and dance Big 5” is a term used to describe the 5 most dangerous animals to hunt on foot. This is a definite highlight of the trip! What would Africa be without having seen some of the Big 5? Traditionally “the Big 5” derives from a hunting term, which describes the most dangerous animals to be hunted on foot. Out in Africa is of course armed with nothing but a camera to shoot, giving guests an opportunity to view these amazing animals from the safety of a vehicle. After a full day with horses and wildlife, the team sets off to the comfort of a near-lying farm, about 6 km. from the reserve. A dirt road spiraling down from the mountain leads you to the cottages built in African style, with thatch roofs. Evenings can be spent around the fire, telling stories of the day, and then falling asleep as the sounds of the African bush come to life. A kaleidoscope of calls, from rutting Impala, the cape turtle dove and the franklin in the early hours of the morning. A journey of the senses, which does not end in Africa. The company aims to create lasting memories and applying techniques with the horses on this personal journey, that will continue to develop the equine-human relationship once back at home. The safari horses have been observed in their natural herd structure, to single out the leader (lead horses) who will give confidence to the herd without the ability to flee, as they would in the wild when faced with a predator or danger. Useful for some, and certainly for a horseback safari company leading guests through dangerous terrain, with full trust in the horse – an exercise which is taken beyond common practice. Horses tend to rely on their sight to detect danger, but we have noticed that the lead horses have developed a heightened sense of smell, to detect a threat which shows us that horses will adapt to their environment to stay safe. Rarely will a herd follow the dominant horse, due to the higher sense of emotion. “We first develop a relationship on the ground with our horses, which will give them the confidence to move forward towards these situations by accepting us as the dominant leader” said Cecile von Auersperg, from Out in Africa Encounters. “Our guides have had extensive training in the bush. We work together with the horse, which has with time become as much a guide as the riders leading the way. We ‘listen to our horse’ to show us what lies ahead in the thicker bush. It is a perfect symbiosis between horse and rider. The horses have taught us so much about these magnificent animals and their relationship with people,” notes von Auersperg. Horses are at their peek in the wild, which allows us to channel their energy or free impulsion to connect with the horse at a higher level. This relationship is based on trust and respect, which sets the path for a long lasting journey. It starts in the romantic, soulful, rhythm of the cradle of natural diversity and continues with the horse at home, continuously strengthening the bond between horse and rider. For more information on a natural horsemanship clinic or riding safari, please visit the website for current dates and pricing. 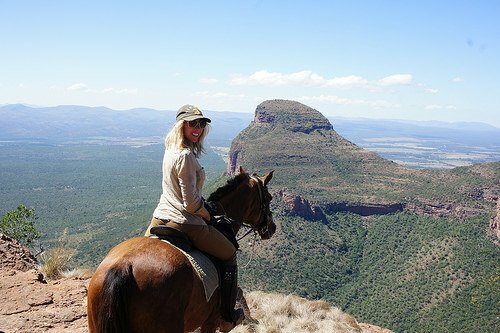 This is a guest post by Cecile von Auersperg an avid equestrian in South Africa. Nancy D. Brown writes the What a Trip blog, and reviews lodging at hotel-scoop.com. Her articles have appeared in Shape magazine, Alaska Airlines, At Home Tennessee, Diablo magazine, San Jose Mercury News, Chicago Tribune, Contra Costa Times and Oakland Tribune newspapers in addition to online publications. An avid equestrian, Nancy reviews horse properties at writinghorseback.com. Based in the San Francisco Bay Area, she specializes in active adventure and luxury travel for baby boomers.